Here at Youthful Balance Medical Center in Palm Beach Gardens we have one the best Sclerotherapy doctors. Sclerotherapy is a medical procedure used to eliminate unsightly spider veins and reticular veins. It involves the injection of a solution directly into the vein which irritates it and causes the veins to constrict and close. 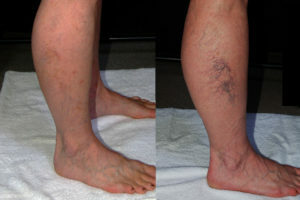 Sclerotherapy is a superior treatment of unwanted veins due to the high success rate and safety profile. Most men and women experiencing spider veins are good candidates for sclerotherapy treatment. The procedure takes about 30 minutes to perform. For most patients, one to three treatments are required for optimal results.